HGL is the file extension associated with HP Graphics Language files. The HP Graphics Language, often referred to as HPGL, is a printer control language developed by Hewlett Packard. HGL files consist of a small number of command lines. The first few lines are set up commands. The following lines are the printing commands that tell the printer what and how to draw on a page. The drawing images are vector images, which means that they are drawn using lines instead of dots. HGL is a standard file format that is supported by most programs. This primary printer control language also uses the file extensions of HG, HG1, HG2, and PLO. These file types can easily be converted from one to another using a converter. 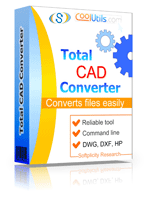 The most popular cad files converter is the Total CAD Converter. This ideal tool is used by most designers to not only convert one file type to another, but also to resize them. HGL files can be opened directly with Corel Paint Shop Pro and Software Companions ViewCompanion Pro on MS Windows.